Do we know where the famous orange color is coming from? 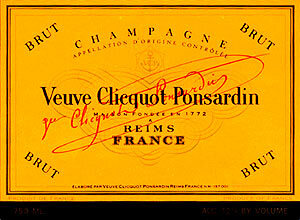 I found the answer nowhere… For all we know, the Veuve herself created the famous orange label circa 1811. After all her daughter was named Clementine so that’s might be a clue! What else is there on that label? The anchor, a word of mouth coat of arms for the family as well as a star evoking the souvenir of a comet that appeared in the sky of Reims in 1811. So she created the beautiful clementine backdrop, which through the years changed from golden yellow to bright orange. Most restaurants participated to the operation. Veuve Clicquot gave back part of its sale revenues to a non-for-profit organization Challenge Aspen that helps handicapped people to ski. All this paraphernalia is quite efficient. 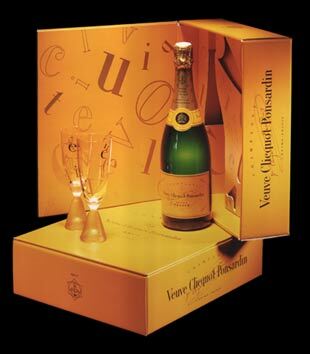 Sponsor of the Fashion Talks with Marc Jacobs at FIAF last March, Veuve Clicquot brought in ice buckets and mock magnums that played the trick: they were the most visible sponsor ! Now what we like about this brand is their creativity. No doubt. Might just be the lingering spirit of the Veuve. To her grand daughter Anne de Mortemart, future Duchess of Uzes, Madame Veuve Clicquot Ponsardin wrote : “ Il faut aller de l’avant, être déterminée et exigeante, laisser son intelligence diriger sa vie. Agis avec audace…. Tu deviendras peut être célèbre…..!! “.“It is necessary to go ahead, to be motivated and demanding, to let intelligence direct your life. Act with audacity….Possibly, you will become famous …..!! “. 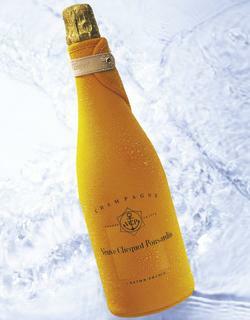 Now the Veuve Clicquot’s orange has become Yves Klein’s blue, a chromatic reference. In other words, art and brand merge once again. As shown in the newest venture of the French Maison de Champagne, restoring the Hotel Du Marc in Reims that once housed the Veuve. Presented at The Salon di Mobilie in Milan was a first display of the decoration, a work of art by the Campana brothers who played variations on the theme of a gloriette, garden decorations as temples that were created in the Middle Age and gave way to the belvederes. And guess what? It is bright orange. 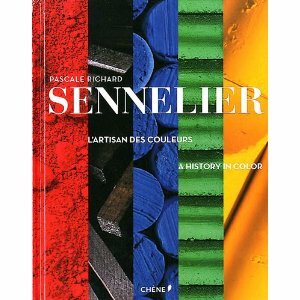 pascale, je suis allée sur ton blog.il est bien fichu, bravo!